Background: It has been reported that the efficacy of acute forms of nicotine replacement therapy, such as nicotine gum and lozenges, improves when sufficient quantities of medication are used. Objective: This analysis examined whether adherence with daily nicotine patch wear was associated with improved rates of smoking abstinence. 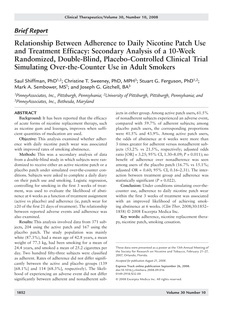 Methods: This was a secondary analysis of data from a double-blind study in which subjects were randomized to receive either an active nicotine patch or a placebo patch under simulated over-the-counter conditions. Subjects were asked to complete a daily diary on their patch use and smoking. Logistic regression, controlling for smoking in the first 3 weeks of treatment, was used to evaluate the likelihood of abstinence at 6 weeks as a function of treatment assignment (active vs placebo) and adherence (ie, patch wear for ¡Ý20 of the first 21 days of treatment). The relationship between reported adverse events and adherence was also examined. Results: This analysis involved data from 371 subjects, 204 using the active patch and 167 using the placebo patch. The study population was mainly white (87.3%), had a mean age of 42.8 years, a mean weight of 77.3 kg, had been smoking for a mean of 24.4 years, and smoked a mean of 25.2 cigarettes per day. Two hundred fifty-three subjects were classified as adherent. Rates of adherence did not differ significantly between the active and placebo groups (139 [68.1%] and 114 [68.3%], respectively). The likelihood of experiencing an adverse event did not differ significantly between adherent and nonadherent subjects in either group. Among active patch users, 61.5% of nonadherent subjects experienced an adverse event, compared with 59.7% of adherent subjects; among placebo patch users, the corresponding proportions were 41.5% and 43.9%. Among active patch users, the odds of abstinence at 6 weeks were more than 3 times greater for adherent versus nonadherent subjects (53.2% vs 21.5%, respectively; adjusted odds ratio [OR] = 3.25; 95% CI, 1.30-8.09; P = 0.011); no benefit of adherence over nonadherence was seen among users of the placebo patch (16.7% vs 15.1%; adjusted OR = 0.60; 95% CI, 0.16-2.31). The interaction between treatment group and adherence was statistically significant (P = 0.022). Conclusion: Under conditions simulating over-thecounter use, adherence to daily nicotine patch wear within the first 3 weeks of treatment was associated with an improved likelihood of achieving smoking abstinence at 6 weeks.